I just bought myself a Boogie Board. The idea is that it simply replaces pen and paper. 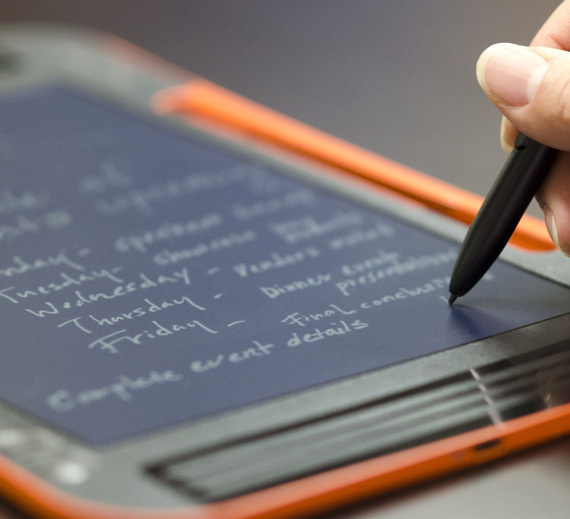 I don’t know how many of you have ever tried writing on a tablet, but that’s quite a painful process, and never, ever, as smooth as it is with pen and paper. The Boogie Board comes quite close! The Boogie Board has a sort of e-ink screen, but instead of just reading from the sreen, you can actually write on the screen. Operation is very straightforward, you simply save a page, and then you clear the page to start writing your next page. In addition, the Boogie Board lets you synchronize with other devices over bluetooth. I must admit, the writing experience is really good. You don’t really notice any difference between the old-school pen and paper and this digital version. However, there are a few shortcomings, which I hope they will address in their follow-up products. The first is that you can’t go back a page. I tend to use my old-school notebooks for doing math (amongst other things). But whenever you’ve reached the end of a page, right in the middle of deriving something, you have to retrace your previous step from the previous page (or simply have a very good memory). But that’s unfortunately not possible on the Boogie Board. Hence, either you improve you memory skills, or you grab a piece of paper to jot it down. But hey, I thought that we were trying to get rid of paper! The second problem is related to the first. You cannot edit pages. Once you save a page, it creates a new page on storage. So, if you save a page halfway through, continue writing, and then save it again, you will have two pages on storage: the first halfway writtin page, and the second completed page. Rather, I’d like to see a single page that is edited, instead of two separate pages. Of course, this is also related to the first problem. Often in my paper notebooks, I write something on one page, and then something else on the next. If I think of something that is related to the first page, I go back to the first page, and then write something there again. But that’s not possible with the current device. The beauty of the Boogie Board is its simplicity. In a sense it is in line with Unix philosophy: do one thing, and do it well. I understand that you shouldn’t want to add too many things on the Boogie Board, otherwise it gets more difficult to operate, create and maintain. So, I wouldn’t include suggestions like erasing parts of the page. The product simply replaces pen and paper, and I never erase something using a pen. But having a back and forward button, and saving edited pages should be feasible I think. Probably it would be a good thing to include a relative page number like 0 for the current page and -1, -2, etc… for previous pages. But I’m not developing the product, so that’s for the company to find out.